Information on Shang period military history relies on three different types of sources, first, transmitted texts from ancient antiquity, second, oracle bone inscriptions, and third, archaeological discoveries. The first can only be relied on with caution, as quite a few texts purporting to inform on the Shang period were written much later, and because excavations do not prove statements of such texts. It is known that during the reign of King Wu Ding 武丁 (r. 1238-1180), the central government disposed of three regiments, called the Central, Left, and Right Regiment (zhongshi 中師, zuoshi 左師, youshi 右師). In oracle inscriptions, the character 師 is written like 𠂤. These were standing armies and were used to defend the royal domain (wangji 王畿) and to secure newly submitted territory. In order to defend border regions, the royal troops (wangshi 王師, woshi 我師 "Our troops") were sent and garrisoned in remote regions. The king's relatives also commanded smaller contingents of troops which were garrisoned in the capital. These units were called zu 族 (Yang 1994: 42). Royal armies were usually commanded by relatives of the king or that of a consort, in the case of Fu Hao 婦好 even the queen. The number of royal troops was about 9,000 or somewhat more (He 1987: 13; Yang 1994: 46). Royal hunts (tianlie 畋獵) were usual occasions to train military arts. Apart from the standing troops, the Shang fell back on the conscription of troops in case of immediate danger. They were called deng 登 (i.e. zheng 征) "conscripts" or zhong 眾 "the multitudes". From the inscriptions, one might deduct the assumption that during the reign of Wu Ding, military conscription was still an exceptional matter, and was therefore minutely recorded, while in later times, when the term deng appears rarely, it had become a usual means of staffing armies. It seems that royal bondservants also participated in military campaigns and had even the chance to raise the social ladder among the king's ministerials (duochen 多臣). It was usual to make war captives (lu 虜) which became slaves of the king or a functionary. The hoard shows mainly helmets and dagger-axes (ge). Liang and Gao 1970: 34. Each domain, whether its ruler was appointed regional ruler or reinstated in this office by the Shang, or conquered by them, was defended by local troops (fangguo jun 方國軍, bangguo jun 邦國軍). These were called like the name of the feud, like Quan shi 犬師, the "army of Quan", and commanded by the respective lord (bangbo 邦伯). The kings of Shang had the power to entrust local armies with the protection of their territory, or to have them participate in a military campaign against a common enemy, like the Tufang 土方 "barbarians", or to carry out punitive campaigns by themselves. The exact size of regiments (shi 師) and companies (lü 旅) is unknown. Chang Kwang-chih (1980: 196) supposes that infantry companies consisted of 100 men, three companies made a regiment, and five chariots formed a squadron, five squadrons a company, with each chariot operated by three charioteers. In oracle bone inscriptions, ma 馬 means "horse" as well as "horse attendant" or "cavalryman", ya 亞 means "commander", fu 菔 "archery commandander", wei 衛 "garrison commandant", quan 犬 "dog attendant", and shu 戍 "frontier commandant" (Chang 1980: 196). Tomb furnishings from the period of King Wu Yi 武乙 (r. 1129-1095) consisted of 69 halberds (ge 戈), 70 spears (mao 矛) and 10 helmets (kui 盔). Oracle inscriptions report of campaigns of 300, 500 or 1,000 troops, in rare cases 3,000, and in a single instance 13,000 men (He 1987: 12). Companies were commanded by a qianfuzhang 千夫長. There were basically two types of troops, namely infantry troops (tuzu 徒卒), and such fighting with a chariot. Fighting units belonged to the tomb furnishings of many of the Shang kings. These burials included not just chariots, weapons and equipment, but also horses and men, which means that they were killed for the burial (xunzang 殉葬), in order to accompany their master in the netherworld. The arrangement of the burial site followed a certain battle tactic, with 300 infantry troops in the front, and five chariots in the back. 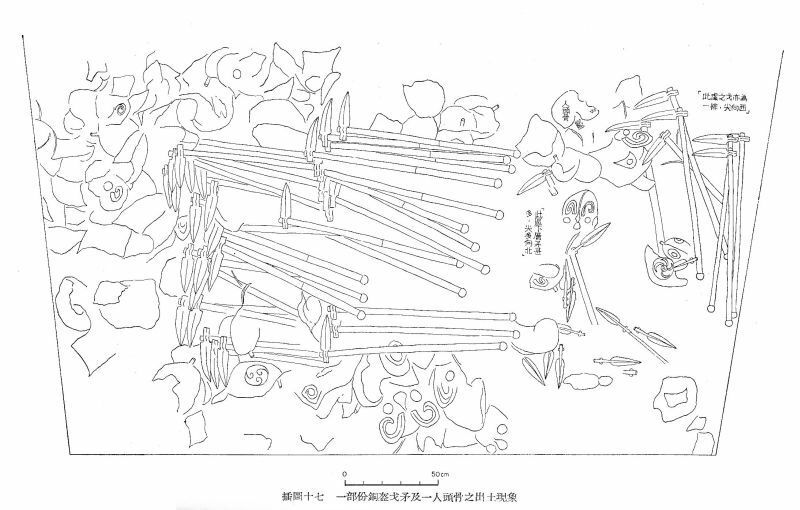 Troops of such burials were grouped in "maniples" (shi 什) at ten, found in one burial pit (keng 坑), and their weapons were therefore also assembled in "bundles" (kun 梱) of ten. This means that armies of the Shang were arranged in decimal units. Ten maniples were one "cohort" (xing 行), and ten cohorts one "legion" (daxing 大行). The decimal system of the Shang is also reflected in transmitted sources like the chapter Mushi 牧誓 of the Classic Shangshu 尚書 "Book of Documents". The wooden parts of the chariot have all decayed, but "shadows" of them remain in the soil. Excavators therefore carefully preserve those parts of the soil, in order to give an expression of the original appearance. From Zhongguo Kexueyuan Kaogu Yanjiusuo Anyang Gongzuodui (1972). Chariots are mentioned only occasionally in early oracle bone inscriptions. Transmitted, but certainly not original, texts (Lüshi chunqiu 呂氏春秋, Mozi 墨子) explain that Tang the Perfect (Cheng Tang 成湯), founder of the Shang dynasty, had just 70 or even 9 chariots in his army. Chariots were carrying a bowman charging the enemy and were therefore also called she 射 "shooter". In late Shang period inscriptions, contingents of 300 chariots are mentioned (Yang 1994: 48). 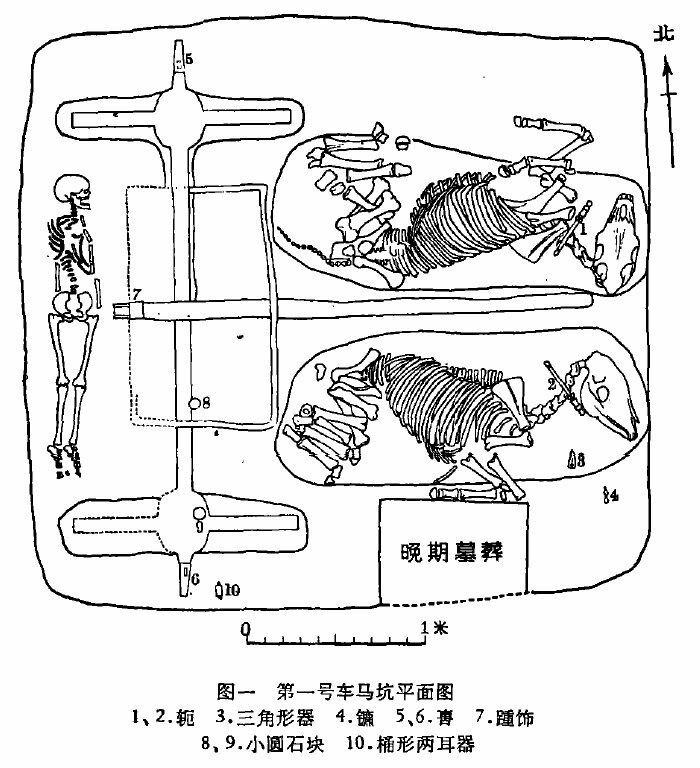 The typical five chariots in the burial sites of Anyang 安陽, Henan, were themselves arranged in two lines, three at the front, and two in the back. The former were drawn by two horses, the latter by four. Each chariot was - according to literary sources - manned with three men, taking with them three types of weapons, namely three swords (dao 刀), two bronze halberds, and two bows (gong 弓, including arrows with bronze heads, zu 鏃). Yet excavations of chariots show that only one person could have manned a chariot. The foremost chariot of a "squadron of five" was buried along with three groups of half-maniples of footmen. While the charioteer was standing in the middle, the fighters on the chariot were protected by breastshields (jia 甲). The left man, operating as an archer, seems to have been the commander of the chariot. This can be known from a commantery of Zheng Xuan to the ode Lu song 魯頌 in the Classic Shijing 詩經 "Book of Songs". Chariot (wooden parts vanished) with two horses and charioteer. The metal remainders are yokes (1,2), fittings of the harness (3,4), axle-caps (5,6), end of the drawbar (7), and an unknown object (10). There are also some small round stones (8,9). From Zhongguo Kexueyuan Kaogu Yanjiuyuo Anyang Fajuedui (1977). The commander of five groups of chariots was called maya 馬亞, and larger contingents were headed by da maya 大馬亞. Yet from the arrangement it can be seen that chariots and infantry troops operated tactically in unison, but there are also many cases of pure infantry campaigns (bufa 步伐). 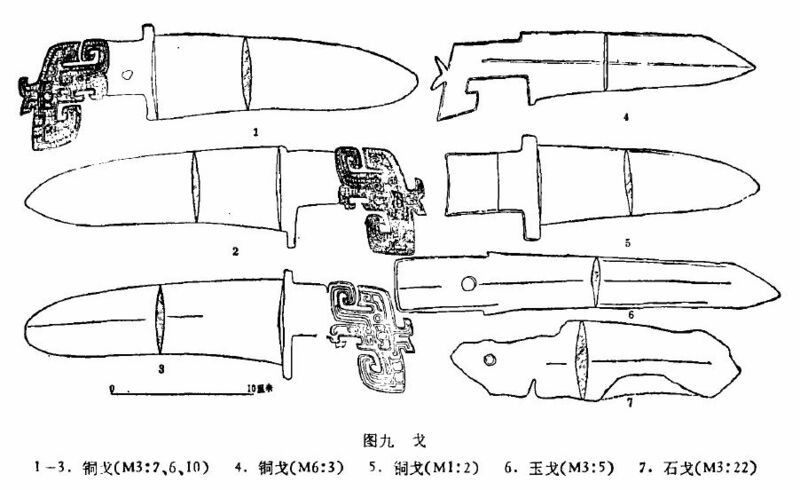 The drawing, taken from Cheng 1960: 171, shows a xiao 削 knive (1), ge 戈 dagger-axes (2,3), a dao 刀 knive (4), a bang 榜 bow fitting, mao 矛 spearheads (6,7), a zu 鏃 arrowhead (8), a chan 鏟 spade (9), a ben 錛 socketed adge (10), and a yue 鉞 axe (11; Cheng says, "halberd"). Shang period tombs include not just weapons made of bronze, but also daggers of various minerals, be it nephrite, or other materials. 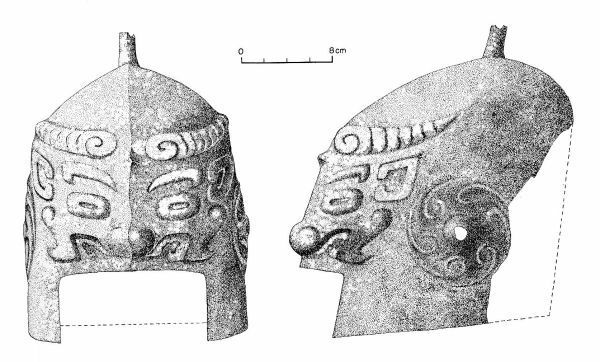 Finds also include ceremonial axes (yue 鉞), many of them with decorations of fierce masks. Drawings showing the development of ceremonial or battle (?) axes through the Shang period. From Xu (1992). Helmet from Anyang. From Liang and Gao (1970): Plate CXIX. Dagger-axes (ge 戈) were typical Chinese weapons. They consisted of a blade tied to a shorter or longer long shaft (bi 柲, up to 3m) in a rectangular way. The blade was joined to the shaft in two different ways, either from fixing it by introducing the shaft into an eye in the metal piece (nei'anbi 內安柲), or by attaching the blade to the shaft by fixing it with the help of eylets through which fixing material is wound (qiong'anbi 銎安柲). A hole in the rear part of the blade served to help fixing it to the shaft. Dagger-axes were usually used from a chariot and could inflict serious injuries when hammered down on footsoldiers. This weapon was very widespread and made out two thirds of the weapons found in the tomb of Fu Hao (Yang 1994: 58). 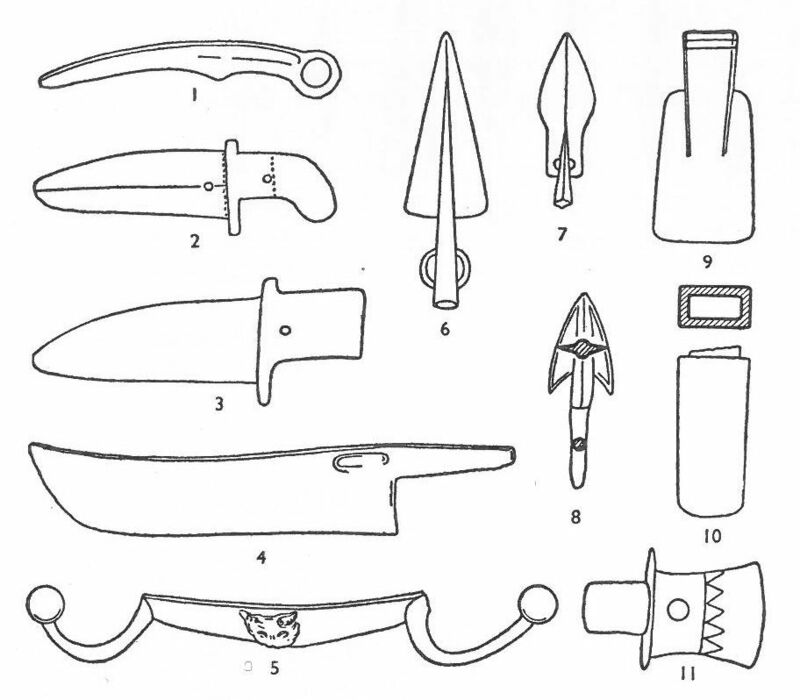 Various shapes and types of ge dagger-axes. The upper figure shows bronze ge, nephrite (jade) ge, and another mineralic ("stone") ge. Some ge were decorated with turquois and other stones. The drawing in the middle shows a typical Shang period ge with the (modern) designations of its parts: outreach (yuan 援) and inner (nei 内) part, and the central, somewhat wider, "fixer" (lan 闌), where the blade is tied to the shaft with the help of two eyelets. The lower figures presents two methods of tying the blade to the shaft, the upper (rare) one with an eye, through which the wood goes, and the lower one with two holes, through which fasting material is wound, while the blade is attacked to the side of the shaft. This lashing method was also used for yue axes. From Shi 1970: Vol. 2, Plate CXXXIV, and Lan and Gao 1970: Plate CXXXVII. Lances (mao 矛, also called shi 鉇, shi 鍦, ta 鉈, cong 鏦, shuo 矟 or pi 鈹) were weapons equipped with a metal or stone blade tied to the tip of a 5-m long shaft (with the help of two rings in the base part), and used to push and sting. 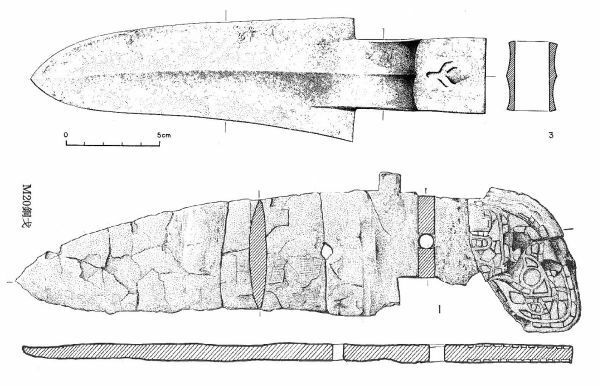 Lances were widespread weapons, and in some tombs, no less than 700 pieces were found (Yang 1994: 58). Axes (fu 斧 and yue 鉞) were not thus important. The second type had a longer blade (up to 40cm) and shaft and were used as insignia by commanders, rather than as weapons. Yue therefore were also made of precious materials like nephrite (jade) instead of metal. Some specimen reached the considerable weight of 5kg. Spears (shu 殳, also called chu 杵, zhang 杖 or bang 棒) were shorter than lances and had no metal blades, but were sharpened to inflict injuries. The simple mode of production, renouncing the use of metal parts, made spears a widespread weapon. This is attested in early literature as the Shijing. Daggers or short-swords (dao 刀) were supplementary weapons with a single-edge blade, and had, as findings show, three shapes, namely one with a straight back, one with a curved back, and one with a straight back and curved head. Example of a dao short-sword and a spearhead. From Shi 1970: Vol. 2, Plate CXXXVI, and Lan and Gao 1970: Plate CXXXVII. Bow and arrow were derived from hunting. The heads (zu 鏃) of arrows (shi 矢) were made of stone, bone or metal. Excavations brought to light a continuous development of arrowheads from the Erligang 二里崗 period to the Anyang period. Arrowheads of brass were produced with the help of moulds yielding six or seven pieces of a length of 5-6cm. Arrows, having a length of about 80cm, were transported in quivers (fu 箙). Barring the metal parts, everything has vanished, but bow fittings are preserved and make it possible to reconstruct the size and shape of bows. 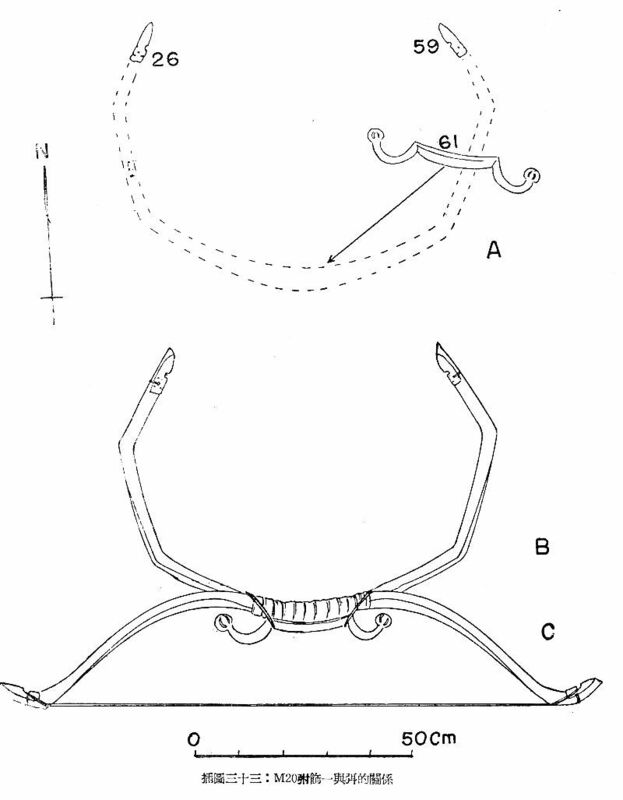 Reconstruction of a bow on the base of the excavation and the remaining metal fittings. 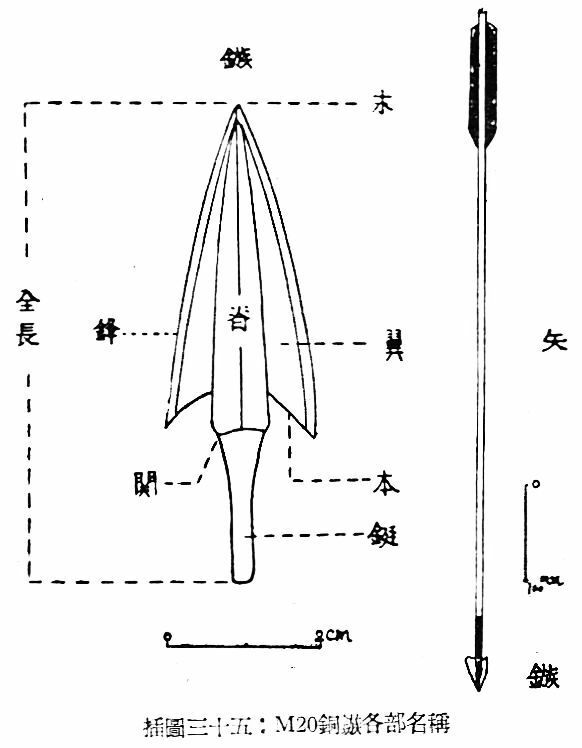 Drawing of an arrowhead (zu 鏃), with each part designated (mo 末 tip, ji 脊 ridge, yi 翼 wings, feng 鋒 blades, guan 関 attachment, ben 本 base of head, ting 鋌 shaft). From Shi 1970: Vol. 1, 115 (Plate 33), and 119 (Plate 35). Cuirasses (jia 甲) were made of leather, and not metal ones were found up to date. It might be that cuirasses were composed of overlying "scales" of leather pieces which were lacquered and strengthened by metal pieces called "bosses" (tongjiapao 銅甲泡). In contrast to this, Shang tombs revealed several shapes of helmets (kui 盔, zhou 冑). Helmets covered also the sides and the back of the head, but not the face. Most of them are decorated with zoomorphic patterns. Shields (dun 盾) were made of wood or leather and strengthened by bosses or lacquer coating. Infantrymen used long shields, charioteers round ones. 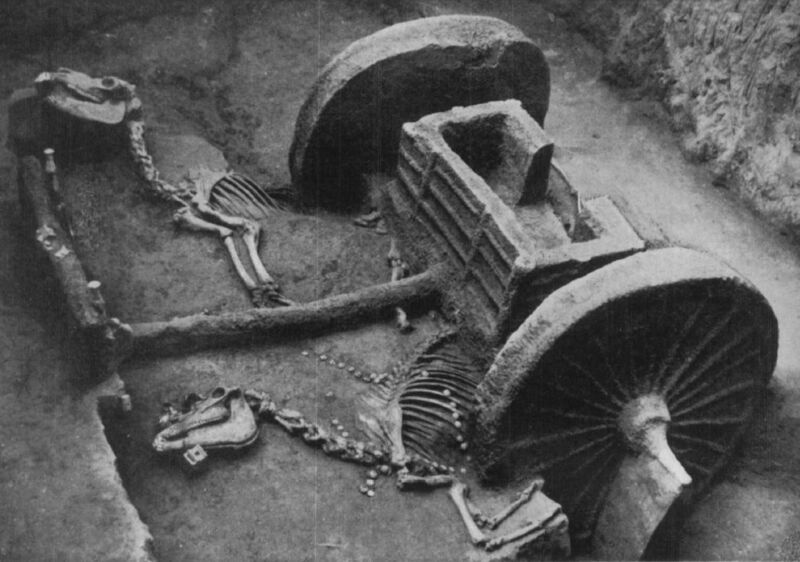 Most spectacular among the finds of Anyang are chariots. Even if the wooden parts have decayed, their shape can be more or less identified in the soil. Chariots and harness of the horses were equipped with many metal fittings. This makes it possible to reconstruct the original shape and size of Shang chariots. They had two wheels, a square body for the charioteer (fangyu 方輿, c. 115 × 80cm, also called chexiang 車箱), and overly long naves (gu 轂), decorated with sheatings (shi 飾), fastened by a linchpin (xia 轄) and axle-caps (wei 軎). With this equipment, Shang chariots were as wide as 3m. The body for the charioteer was made of a frame (xuanzhi 軒輊) filled with basketwork and decorated with metal bosses. The drawbar (yuan 轅) was at front equipped with a draught-pole (zhou 輈, cheheng 車衡) and yokes (e 軛) and in the rear end tied to the axle (chou 軸). The wheels (lun 輪) had a diameter of c. 135cm and were driven by 18 spokes (fu 輻). Chariots were drawn by two horses, as can be shown in practically all archaeological findinds. The royal seat of the Shang kings was protected by city walls (chengguo 城郭) and moats (chi 池). This is true for practically all identified seats, as Erligang, Erlitou 二里頭 and Anyang. The length of the city wall of Yanshi 偃師 (Erlitou) was 1,700m × 1,200m long and encompassed an area of 1.9km2, that of Zhengzhou 鄭州 (Erligang) had a total length of 6,960m, protecting a surface of 2.5km2. The Erlitou wall was 19-25m wide at the base, in some places even 40m. 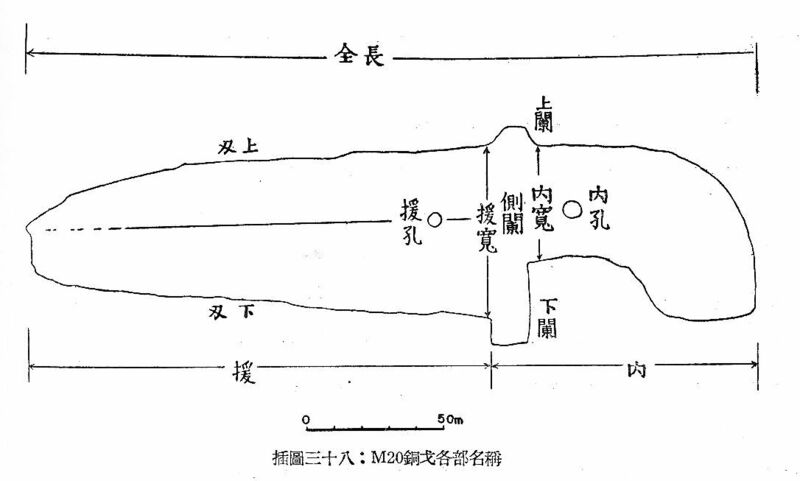 No city wall was discovered in Yinxu, but a moat with a total length of 8km, a width of 7-21m and a depth of 5-10m, encircling an area of 2.4km2 (Yang 1994: 63-64). In military terms, the Shang period can be divided into two stages, namely the early stage, when the Shang kings fought against local powerholders and sought to defeat them, and the later stage, when the Yellow River plain was dominated by the Shang and the main enemies were polities and tribes living in the surroundings, mainly the west and the south. According to the transmitted legend, the Shang dynasty was founded after Tang the Perfect had defeated the royal house of Xia in the battle of Mingtiao 鳴條 (located in Xiaxian 夏縣, Yuncheng 運城, Shanxi, or close to Luoyang 洛陽, Henan). Even if the historical events of this battle must be taken with some caution, it is important to see that the king of Xia was supported by auxiliary troops from the lords of Gu 顧, Wei 韋, and Kunwu 昆吾. The victor, Tang the Perfect, enslaved the forces of Xia. Historically proven is the war of Wu Ding against the Guifang 鬼方 and Tufang tribes roaming in what is modern Shaanxi and Shanxi. In 1296 (traditional reckoning), Wu Ding levied an army of 5,000, and in 1293 even 23,000 men (Yang 1994: 53). The Shang many times fought with the Qiang 羌 tribes, which had formerly been their allies. These campaigns are not only attested in oracle inscriptions, but also in the inscriptions of bronze objects discovered in the tomb of Fu Hao. The inscriptions remember the Queen's military campaigns against the Qiang, Yi 夷, and Tufang. In one instance, the royal forces amounted to 13,000 troops (Yang 1994: 54). The ode Shang song 商頌 in the Shijing reports of campaigns against Jing 荊 and Chu 楚 in the region of River Han and the middle Yangtze valley. King Di Yi 帝乙 (r. 1184-1080/1060/1050) campaigned against the Yufang 盂方, which lived quite probably in the Huai River region, or (less probably) in the northwest. The Shang victory submitted three local lords (fangbo), meant captivity for 1,570 men, and brought booty of two chariots, 160 shields, and 50 helmets and cuirasses(Yang 1994: 55). From around 1100 BCE, the Guanzhou 冠周 (as they are called in oracle inscriptions), better known as Zhou 周 (11th cent.-221 BCE), in the Wei River valley 渭水, residing in Qi 岐, became stronger, and began to occupy polities which were allies of the Shang, like the state of Chong 崇. In that place, the Zhou even built a residence (Fengyi 酆邑, close to modern Xi'an 西安, Shaanxi). In the same period, the Renfang 人方 tribes in Shandong and the Huai River region rebelled against the Shang. As a historic event, the Zhou and their allies defeated the Shang in 1027 in the battle of Muye 牧野 (close to Xincheng 新鄉, Henan), and shortly thereafter took over their kingdom. Chang, Kwang-chih (1980).Shang Civilization (New Haven/London: Yale University Press). Cheng Te-k‘un (1960). Archaeology in China, Vol. II, Shang China (Cambridge: Heffer). He Shouquan 何壽全 et al., ed. (1987). Zhongguo junshi shi 中國軍事史, Vol. 3, Bingzhi 兵制 (Beijing: Jiefangjun chubanshe), 9-18. Liu Yiman 劉一曼 (2002). "Lun Anyang Yinxu muzang qingtong wuqi de zuhe 論安陽殷墟墓葬青銅武器的組合", Kaogu 考古, 2002/3: 63-75. Yang Shengyong 楊勝勇, ed. (1994). Zhongguo yuangu ji sandai junshi shi 中國元古曁三代軍事史 (Beijing: Renmin chubanshe). (Series Zhongguo quanshi 中國全史. 3). Xu Jing 徐菁 (1992). "Cong Xingan Shangmu chutu tongyue kan yue de lishi guiji 從新干商墓出土銅鉞看鉞的歷史軌迹", Nanfang wenwu 南方文物, 1992/2: 55-61. Zhongguo Kexueyuan Kaogu Yanjiuyuo Anyang Fajuedui 中国科学院考古研究所安阳发掘队, ed. (1977). "Anyang Xinxu Xiaomintin de liang zuo chema keng 安阳殷墟孝民屯的两座车马坑", Kaogu 考古, 1977/1: 69-73. Zhongguo Kexueyuan Kaogu Yanjiusuo Anyang Gongzuodui 中國科學院考古研究所安陽工作隊, ed. (1972). "Anyang xin faxian de Yindai chema keng 安陽新發現的殷代車馬坑", Kaogu 考古, 1972/4: 24-30.